Andrew "FoFo" Gilich for mayor! A few weeks ago, I had the honor of addressing the august Southern Foodways Alliance Symposium, which would be the finest food conference in the country even if it didn't dedicate a least one entire evening to various forms of fried catfish and booze. The subject of my talk was the global influence on the South, as shown in the diverse people of Biloxi, Miss. -- shrimpers and the children of shrimpers, bakers and market tenders. It's a subject -- and these are people -- dear to my heart, and I found myself unexpectedly emotional as I told their rich stories: of FoFo Gilich who grew up working in a cannery and was nearly mayor of Biloxi; of Richard Gollott, who is the man literally responsible for the establishment of a vibrant Vietnamese community in this town; of Sue Nguyen, whose "Vietnamese bakery" became, over time, simply Biloxi's bakery; and more. I'd like to share those stories with you here. If you'd rather not listen to me yap, below the video is one of these stories in written form, on Mr. Leroy Duvall, a retired shrimper and the president of a Cajun social club. And if you'd like to read more of the oral histories I collected in this part of the world, please visit the Southern Foodways Alliance's website. SFA 2010: "Cajuns, Croats, Vietnamese: On Land and Sea in Biloxi" presented by Francis Lam from UM Media Documentary Projects on Vimeo. This story originally appeared on Gourmet.com. I just watched a table the size of a twin bed get piled with crawfish. Twice. So this is how they roll at the French Club. Outside, in the parking lot, half a dozen beer-fueled men watched propane-fueled pots, sending an eventual 1,500 pounds of crawfish to their hot and spicy ends. I have to confess that I wasn't thrilled at first about showing up at the Fleur de Lis Society. This was months ago, and I was looking for stories of Cajun fishermen, but clubs kind of weird me out, with their odd little exclusivities and mutated social hierarchies. On my way over, I imagined arcane secret-society stuff: handshakes and passwords and rituals in funny hats with the window shades down. Who knows what these people are all about? I've seen movies. I don't want to end up at the bottom of the Gulf, strapped to a sack of crawfish heads. I pulled up to their imposing meeting hall, a dead ringer for an airplane hangar, with nerves firing, and walked in to find … a couple of guys watching SportsCenter at a bar. I met Mr. Leon, Mr. Ben, Mr. Tee, friendly men in Hawaiian shirts and pleated jeans who pulled up a chair for me and chatted the way uncles do. Leroy Duvall, the club's president, came over and shook my hand, a slight, taut man with a head of white and skin that's been in the sun his whole life. He apologized for the ruckus as I set up the recording gear. It was a big day. Three years after Katrina took their home they'd just gotten into their new building, and the first thing he did was call in a beer order, now clanging in on hand trucks and dollies. Seventy-five years ago, Cajun fishermen looking for work moved into Biloxi from Louisiana. In a strange town far from home, they settled into a tight-knit community in East Biloxi. They founded the French Club, as everyone called it, as a place to have dinners and dances together, and occasionally raise some money for members in bad shape. I asked whether the Club tries to preserve French culture. Mr. Leroy nodded, talking about the dances they put on, but then said, "I don't really speak very much French. I wish I did but I don't, and a lot of us don't ... the younger people, you know." There wasn't a trace of irony in his voice when he referred to himself as one of the younger people, despite his 64 years. Mr. Leroy worked on shrimp boats for most of his life. He misses it. "No traffic jams," he said to me. "No 9 to 5. You just worked. But it was just the pleasure of being out there; the freedom and the good fresh air." It's demanding work, physical work, but I imagine of the kind that makes your body still feel young at 64 if it didn't make you feel old at 32. But the realities of age still stand. I asked him why the club only has 300 members now, instead of the 600 it used to have. "The older people got older," he said. "East Biloxi started dying away. And then Katrina finished it off by taking everything out. A lot of the older people are too old to try to come back down here and start over." I asked if he keeps in touch with his displaced members. "That's one reason we put the club back down here," he said. "After Katrina took our building away there was no consideration about going anyplace else. Our people -- no matter where they're at -- they know whenever they come back, the French Club is still here. A lot of our members passed away; we have a lot of older people. Every day we see them they ask when we're going to open. They want to come back and we're trying to get it back. For the people." Behind us, men loaded the new coolers with beers and Cokes and Barq's Root Beer. I've come back a few times since hoping to catch the club in action, but every time I drive by, it's just Mr. Leroy's old pickup in the parking lot. I poke my head in the dark hall. It's an awfully big room for one man to be in. I say hello, he smiles warmly, counting change or taking out the trash. He tells me, every time, that I just missed everyone, that I should come by for dinner. We chat, I thank him, and leave him to his chores. But today, I walk into the French Club and my eyes need a few minutes to adjust to the darkness from the Mississippi sun. When I can see again, the tables are crowded with people piling high the spent bodies of crawfish. The aisles are crowded with couples dancing to Cajun music played by a man with a Croatian name. I can barely make my way through the crowd, taking pictures to go with my interview, and looking for Mr. Leroy. 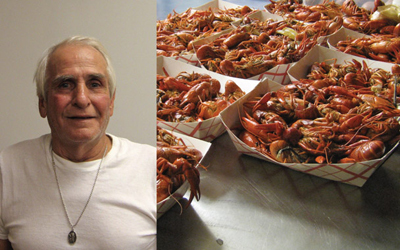 When I finally find him, my photos all taken, he asks, "Did you get any crawfish?" I regretted saying that I had to go. "Well," he says. "You're welcome here anytime. You know that, don't you?" I smiled back at him. "Yes, I do, Mr. Leroy. Yes, I do."